This is the perfect introduction course for those wanting to learn proper techniques for snow climbing, especially in steep terrain where ropes are being used to protect from falling. We will spend the day learning about and practicing different footwork suitable for the terrain, climbing in balance and proper use of ice axe and crampons for ascending and descending steep snow. The course will also cover different roped climbing scenarios, how to ascend and descend as a member of a rope team and self-arrest. This course is a prerequisite for a summit climb of Mt. Hood via the South Side Route and is often combined with other entry-level climbs. Steep snow climbing is an aspect of alpine climbing that is unlike movement on steeper rock and ice. The techniques that we use are not always intuitive, but they are accessible to anyone who is coordinated and athletic. You will develop comfort with snow climbing in this clinic that will open up lots of terrain for you to explore. Interested in a trip? Call us today to get started on your trip reservation. We will take the time to place you on the expedition that is a fit for you. When you call us you will speak to someone knowledgable about all or our trips and locations. Or fill out one of our forms to either reach out to us or sign up for a trip. The steep snow climbing clinic is a detailed introduction to climbing on snow. From steep and firm neve, to alpine ice, the mountaineer must be ready for any conditions. Our guides will introduce footwork for a range of conditions and slope angles. You will learn the many ways to use and hold an ice axe and use crampons to increase efficiency of movement. Lastly, together with your guide you will practice two rope-systems, and learn how they apply to mountain conditions. Lastly, you’ll learn about self-arrest and how it applies to both roped and unroped climbing. "I am very happy with my TMG experience. The guides were professional, personable, and extremely concerned about safety. . . I absolutely give highest marks to these guys. 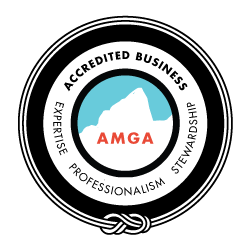 If you don't have much Alpine experience, or just want the security of seasoned veterans guiding you up this mountain, then I strongly recommend you sign up with them. Thanks, guys, for a great experience!!" "What a fantastic experience gaining the summit of a mountain we've gazed on from Portland for 25 years! . . . We learned a great deal, had a ton of fun, felt in very capable hands, and had the reward of summiting on a beautiful clear day. The value of being with a professional, certified, guide and guiding organization was evident throughout. Kudos to the TMG team who were responsive, supportive, and fun to work with every step of the way." "We booked 2-day overnight program on Mt. Hood with Timberline Mountain Guides. Our guides were great, . . super friendly and reputable. The program did not go as planned due to inclement weather but we still had fun and good experience. The guides were definitely flexible and provided guidance during the trip. I would recommend going with them if it's your first climbing trip on Mt. Hood for sure." There are no prerequisites for joining this clinic – we’ll teach you everything that you need to know! At the start of your program you will be asked to sign an Acknowledgement of Risk form. We recommend that you take the time to read this form prior to arriving, and we invite you to call our office in advance if you have any questions about it. Climbing and mountaineering involve inherent risks - many that we can manage to a degree - some that are beyond our control. By signing, you assume responsibility for all the risks associated with this activity, and you acknowledge the hazards that are beyond our control. We do not assume liability for injuries or death. All participants are completely responsible for all medical and hospital costs associated with any injury, rescue or evacuation. You go at your own risk. A $300 per-person, non-refundable deposit is required to hold a spot on one of our trips. Full payment is due 90 days prior to the first day of your trip and will be automatically billed to your credit card. If you sign up for a trip that starts within 90 days, full payment is due at that time. We accept Visa/MasterCard. We do not accept checks or money orders, or American Express. For our international and Mount Rainier trips the balance is due 120 days before the trip starts. Timberline Mountain Guides, Inc. reserves the right to cancel a trip due to lack of sign ups, or other factors beyond our control. In this case, you will have the option of receiving a refund or rescheduling for a later date. Timberline Mountain Guides, Inc is not responsible for additional expenses incurred including non-refundable airline tickets, equipment, lodging and other travel related expenses. If you cancel for any reason, prior to 90 days before your originally scheduled trip dates, we will happily give you a refund less your $300 deposit, per person. If you cancel less than 90 days, but more than 60 days, before your trip, a date-change or credit can be issued but no refund is available. Credits are valid until the end of the following year and incur a $100 administrative fee. No date changes or cancellations can be made within 60 days of the start of the trip, and no credit or refund will be available. Date changes and cancellations must be submitted in writing. Date changes will be charged a $100 per person administrative fee. For international and Mt. Rainier Trips, no changes or cancellations can be made and no credit or refund will be available. A $300 per person, non-refundable deposit is required at sign up, with a balance due 120 days before the trip starts. All credits are valid until the last day of the following year. Rescheduled programs must take place within the valid credit period. We partner with the Timberline Lodge to provide snowcat transportation on our Summit Program. This machine is a great resource for bypassing the lower flanks of the mountain however, due to the extreme weather and snow conditions that we experience on Mount Hood, there is no guarantee that it will be able to access any particular location or elevation. We do not offer refunds, nor will we reschedule programs in relation to the snowcat's ability to travel in the conditions presented. Climbs will depart from the lodge at the planned time, with or without snowcat transportation. Each climbing program has a maximum climber-to-guide ratio, listed at the bottom of the climb description. These ratios are determined based on the hazard exposure and the limitations of protection systems that we employ. For that reason, our guides will not exceed this ratio in technical terrain, and climbers in open group programs can be turned around to maintain the maximum climber-to-guide ratio of 3:1 for those continuing up. Private Guides are available for anyone concerned about climbing with unknown partners. Regardless of forecasted weather, we are unable to offer refunds, exchanges or rainchecks in the weeks or days before a scheduled trip. We will uphold our written policies in all cases. Mountaineering, Rock Climbing and Ski Mountaineering are demanding activities and are very serious undertakings. The more prepared you are, the more enjoyable your trip will be. Physical fitness is one aspect of preparation that takes time and commitment. It is an important component of risk management, because the more fit we are as a team, the more capacity we have to deal with challenging situations. 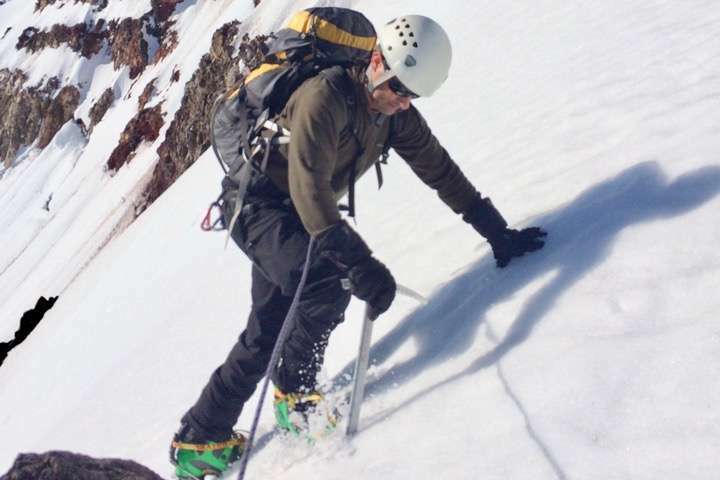 Most mountaineering challenges involve long duration and medium to low intensity. All of our mountaineering climbs require very good physical fitness. To participate in any of our mountaineering climbs, you should be able to hike or climb for 5 to 6 hours with a 20 to 40 pound pack and ascend 4,000 feet of vertical gain per day. In order to prepare for such a feat, you should be exercising 3 to 4 times per week for at least one hour per session. We recommend doing long hikes on your days off that are at least 6-8 hours long and involve at least 3,000 vertical feet of ascent and descent. The guide will make a decision to turn back if they feel that the group is being placed in jeopardy. We are not in a position to evaluate your fitness level. Our guides can only make decisions based on the speed of the team relative to current conditions and forecasted weather. If you are overweight or are in poor health, please consult your doctor before signing up for any trip. On some trips you will be carrying heavy loads, climbing technical terrain with an overnight pack, climbing at high altitude, and climbing on little or restless sleep. These conditions require that you be in excellent fitness. If these activities are at your absolute physical limit, there will be little room to handle additional challenges like inclement weather, adverse conditions or discomfort. Please be in the best fitness you can be, before arriving to climb Mount Hood. First and foremost, it is imperative that you inform your guide of all your medical history and current physical condition. This information helps your guide to make informed decisions about your program, and in the event of an emergency, potentially life-saving decisions. Our programs operate in remote locations where advanced medical care and evacuation may not be available for hours or days. If you have any long-term side-effects from past injuries or illness please include these in your medical history. Any current injuries or conditions – even those that seem irrelevant – should be disclosed, as well as a list of all medications that you are taking. Any asthma or allergies to food, animals or the environment must be included in your form. The key to this is to try to be well hydrated, and well fed before your trip begins. Another helpful tactic is to spend some time at 6000’ at Timberline Lodge before your trip. If you aren’t staying at Timberline, consider coming a couple days earlier and taking some day hikes above the lodge to gradually expose your body to the increased demands of exertion at altitude. Our programs operate between 7,000 and 15,000 feet in the United States, and up to 19,000 feet internationally. If you are traveling from sea-level we recommend that you arrive early to give yourself time to acclimate to the altitude before you exert yourself on the climb. If you are going to elevations above 15,000 feet, we recommend speaking with your doctor about obtaining a prescription of Diamox. If you have a history of altitude illness, you may want to talk to your doctor about using Diamox at even lower elevations, as well as obtaining a prescription for emergency dexamethasone. On some trips you will be carrying heavy loads. Sleeping and eating conditions on overnight trips are not always ideal. Weather is often unpredictable and may disrupt climbing. The mountain environment is constantly changing, so you must be prepared for any weather. No one can control the weather and route conditions. We cannot control your fitness, but you can. Sometimes conditions make the climbing more tiring, for example in the cold and the wind. Sometimes conditions dictate that we move fast to catch a weather window, or else we’ll be forced to turn around. The more physically prepared you are, the better opportunity your team will have to reach the summit in the variety of conditions that we find in the mountain that we guide. We will make every effort to help you get to the summit. However, our priority is always to descend safely, even if that is because we can’t move fast enough to complete the objective. Please do your best to prepare adequately for the physical demands of mountaineering. Trip cancellations can happen for a variety of unexpected reasons that are beyond anyone’s control. For example, airline delays and cancellations, lost luggage, injuries right before your trip, and family emergencies. Because we must plan our trips months in advance – not knowing what conditions or weather may bring – we are unable to offer refunds, exchanges or rainchecks for our programs in the weeks before they begin and we will uphold our written policies in all cases. After the cancellation deadline has passed it is very unlikely that we’ll be able to resell your spot, in the event that you must cancel your participation in a program. With this in mind, we strongly recommend that climbers who register for our programs obtain travel insurance. There are many different companies that offer travel insurance. Each policy has specific limitations that you will need to clearly understand in order to choose the best policy. Some require you to purchase a policy within a limited time of registering for a trip, so we recommend that you look into your options as soon as possible.